Somebody once said, “the better you know something, the easier it is to describe.” The latter is certainly true with my ability to describe running efficiency. Six-plus years ago, my definition was a Twitter-worthy 55 characters. Today, it’s even trimmer: forward posture, rearward limbs. But those 32 characters still don’t quite do justice to a sport that, while utterly simple, seems utterly impossible to avoid injury. If we can get a full breath? 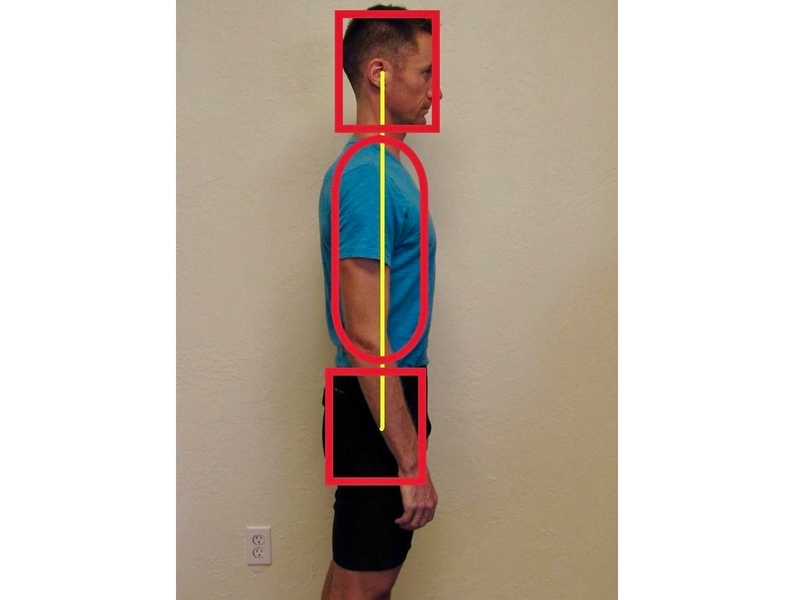 Posture goes beyond simple alignment. It affects the entirety of our running efficiency. Thus, it has to be addressed as the foundation and is deserving of a second take in this article. However, alignment actually has two dimensions: position and angle. Position relates to whether or not each system–say, the ribcage–is stacked directly on top and/or below adjacent systems. For instance, does the ribcage stack on top of the pelvis, and does the neck stack on top of the ribcage? Angle relates to the orientation of each system. Is each system angled in a neutral direction? Or is one system angled too far forward (anterior) or rearward (posterior)? Ideally, at each system, the forward or rearward angulation should be minimal. The notable exception occurs in the spine, which has two small extension curves–lumbar and cervical–that are counterbalanced by a flexion curve in the thoracic (ribcage/trunk) area. In the efficient state, these curvatures are rather minimal, but they can exaggerate when inefficient. The most common and impactful postural deficits occur at the trunk and pelvis. These are common because, in the human body, there is a lot of leeway and freedom to how the trunk and pelvis move. But in prolonged locomotion, we desire a stacked, neutral system. A posture which places the trunk too far forward (anterior). A posture which places the trunk too far rearward (posterior). In my clinical observation, the latter is far more common. This malalignment can happen from above–trunk on pelvis–or from below–the pelvis shifted too far in either direction atop the legs! Issues of angle are most evident in the ribcage. The ribcage is a bell-shaped structure, as it’s rounded near the top and has both a forward and rearward curvature. Like a church bell in a neutral state, that bell should ‘hang’ straight down, with equal curvature in front and back. The trunk sitting too far back, causing the ribcage to angle forward. The trunk sitting too tall, also causing the ribcage to angle forward. An inefficient ribcage angle can have negative effects throughout our whole body. These positional or angle issues may seem subtle, but their effects on running efficiency are massive. In our first posture article, the thesis was that “poor posture will cause increased landing stress.” This is true, but it’s only a small part of the story. Indeed, a rearward orientation–in either position or angle–shifts the center of mass rearward, making it easier to over-stride. Over-striding creates excessive braking forces that must be absorbed by the body. But inefficient posture also affects propulsion in major ways. First, inefficient stacking impairs the hips’ ability to push off. A forward pelvis (on a rearward trunk) prevents the hips from fully extending behind. Second, inefficient posture dramatically impairs anterior core (abdominal) function. Automatic and efficient core activation requires that the spine and pelvis have both efficient stacking and angulation. If stacking is impaired–with the trunk shifted ‘off’ the pelvis–or if the trunk is excessively angled, the abs are in an overstretched position and can deactivate. Impaired abdominal function is a big problem. Not only do the abs help maintain stability upon landing, but the abs are a powerful hip-flexion assist in the running stride. Our lower abs play a huge role in helping flex the leg upward and forward. Without the abs, the hip flexors will fatigue quickly and turn a strong stride into a shuffle, or turn an efficient landing into a lope-y over-stride. Lastly, inefficient trunk and pelvis stacking and angulation can impair breathing! Poor ribcage angulation in particular impairs our ability to efficiently inflate and deflate the lungs, making our breath only a fraction of its potential. Weak push-off, weak forward lift, and poor breath: all the physical training and mental toughness in the world cannot overcome these running-efficiency killers. Simply put, poor posture makes for slow and painful running! Feel It: First, place one hand at your ‘belt buckle’ and the other on your sternum (chest bone). Stack It: Then, adjust your stacking alignment by moving your trunk and pelvis such that your hands stack vertically and your body systems below (lower and upper legs) are directly beneath the pelvis. ‘Neutral Bell:’ Adjust your trunk position so that the ribcage ‘bell’ is ‘hanging’ in neutral. For a posterior (back-leaning, extended) trunk, this involves substantial sternum relaxation downward toward the belly button. For an anterior (forward, flexed) trunk, it is the opposite. 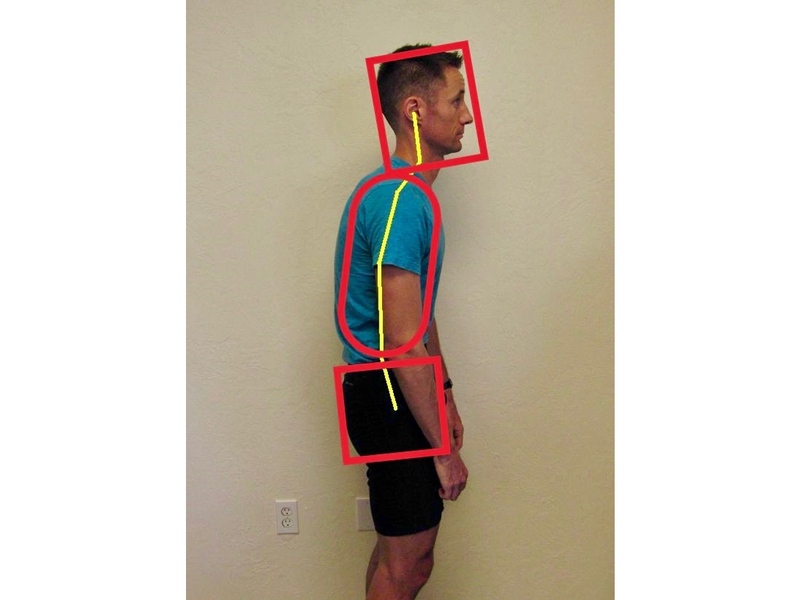 Shoulder Adjust: If the trunk angle changed substantially, it will take with it the shoulders and neck. Place the shoulders neutrally atop the trunk. Neck Adjust: Lastly, stack the head and neck (as best you can) atop the ribcage. This is usually a rearward and upward lengthening, as if the back of the head is pulled upward from a string. Because of long-present posture habits, this process can be simple to establish but difficult and awkward to maintain for more than a short time. This is often due to significant joint and soft-tissue restrictions, especially in the ribcage, shoulders, and neck. These deficits can greatly improve with upper-body mobility work. (This deficit was discussed in our article on trunk and shoulder mobility. We also discussed further treatment techniques using a foam roller in another article). In a forward orientation for running, the alignment remains in a straight line but there is a forward inclination at the angle and hip hinge, which naturally puts the rest of your body forward. For those of you who tend to overextend the trunk, you’ll be shocked at how much easier it is to get and stay forward-oriented in your stride! A neutral and forward torso for running. 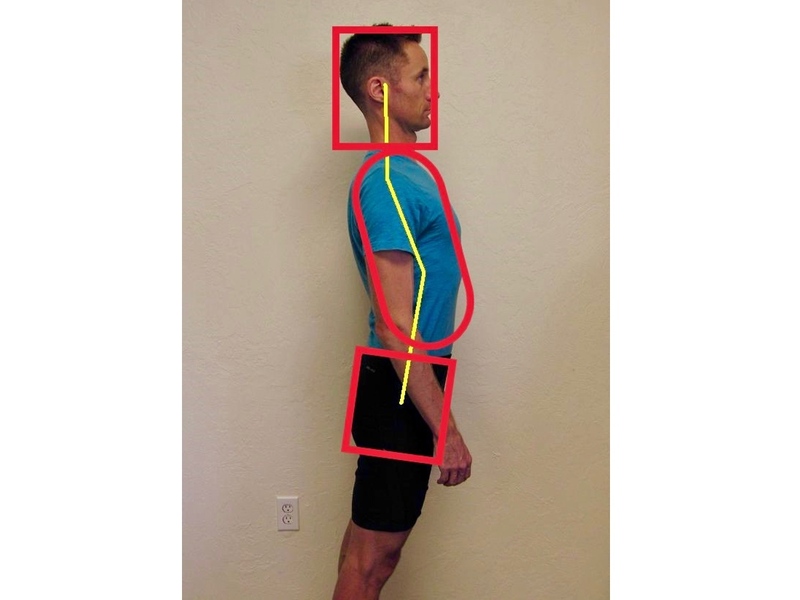 If you struggle with finding or maintaining a neutral posture, get some help. Another running friend is a good start, but if you’re simply too stiff to get where you need to be, a skilled physio can help you get there. 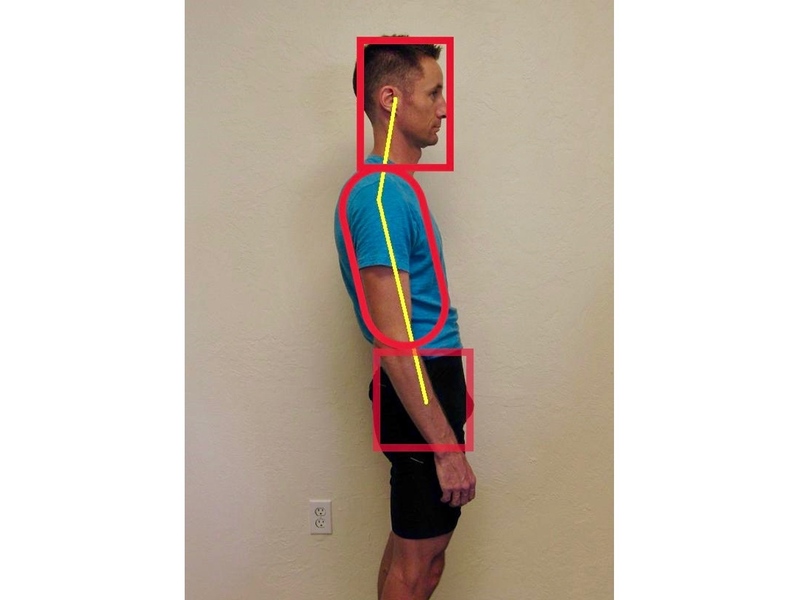 Then, know and remember the importance of applying your unique postural needs in and out of your running. For example, if you struggle with a rear-stacked and rear-angled trunk, maintaining your pelvis well behind your trunk and relaxing the sternum needs to be an ongoing focus while running. Find your efficient place before running and then occasionally check in during the course of a run, either visually (checking your reflection in a window, for example) or by placing your hands on your chest and pelvis. More importantly, we run how we live so keeping neutral posture while sitting, standing, working, and driving is even more important. Fixing your posture by day will make it easier to stay efficient on the run. 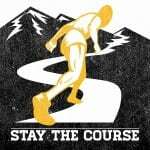 I’d love to hear your feedback on how a neutral posture changes your landing, push-off, breathing, and overall speed, endurance, and enjoyment while running! Good luck. 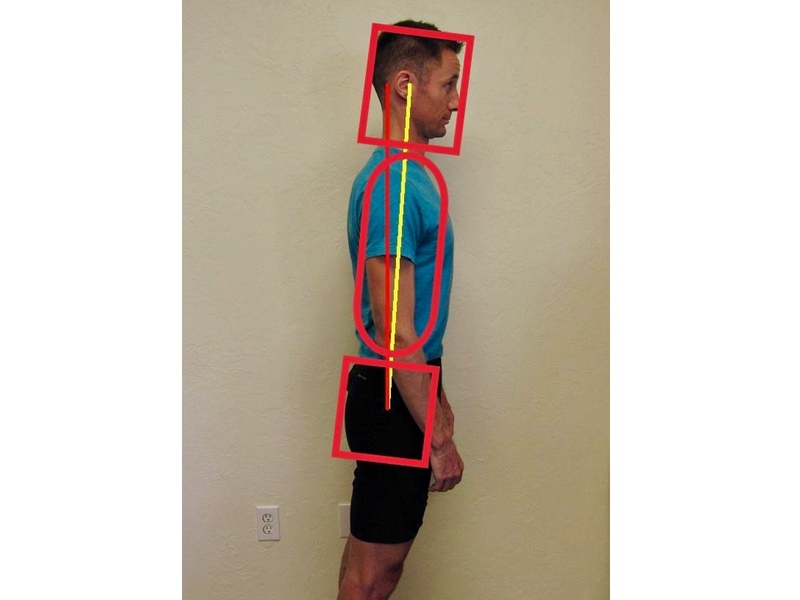 After using this article to find a neutral posture, where does your current posture match and where does it deviate? In consciously taking a neutral posture into your running, do you notice any outright differences in how running feels? 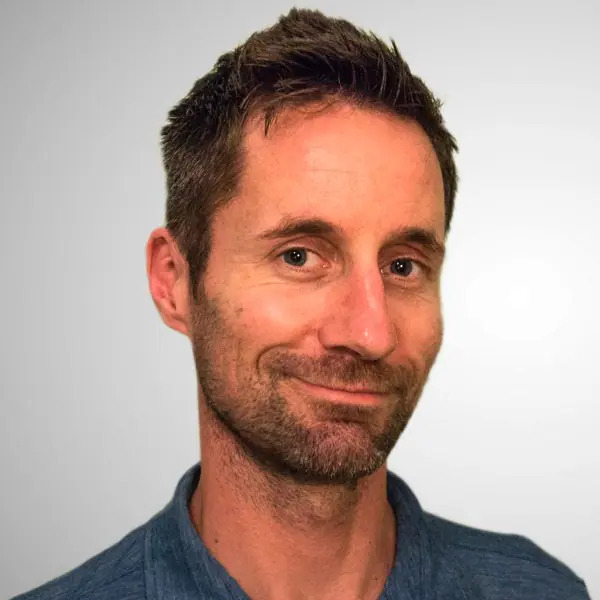 Since so many of our posture habits develop in our regular life, what thoughts do you have about ‘shoring up your posture’ at work, in the car, and elsewhere? When I have good posture while running my cadence will increase about 10 steps per minute, my heart-rate will drop and consequently it takes much less effort to run. A thank-you to Joe for helping me get to this point. If you find that it is difficult or confusing to know if your posture is neutral while you run, a good physical therapist can help you! PT is not just for injuries – it can prevent injuries from ever occurring in the first place! Great article Joe! Thanks! I think there are four stages to making changes in posture, running or otherwise. 1. Find out what you are doing wrong. 3. Find out whats’ right. Leaving out stage 2 will layer tension upon already existing tension and is unlikely to bring about lasting change. Everybody races to start stages 3 and 4 because we are great at “doing”. Try something, anything to relax or loosen the body before stacking, aligning,positioning or changing angles. This article is spot on and one of the easiest things most runners can fix with consistent effort. Personally I like that you pointed out to incorporate it into your everyday life. For me it’s alignment check while brushing my teeth morning and night. It is also my go to at the back end of a race to ensure my form stays good and helps with leg lifts. Thanks for the pictures.